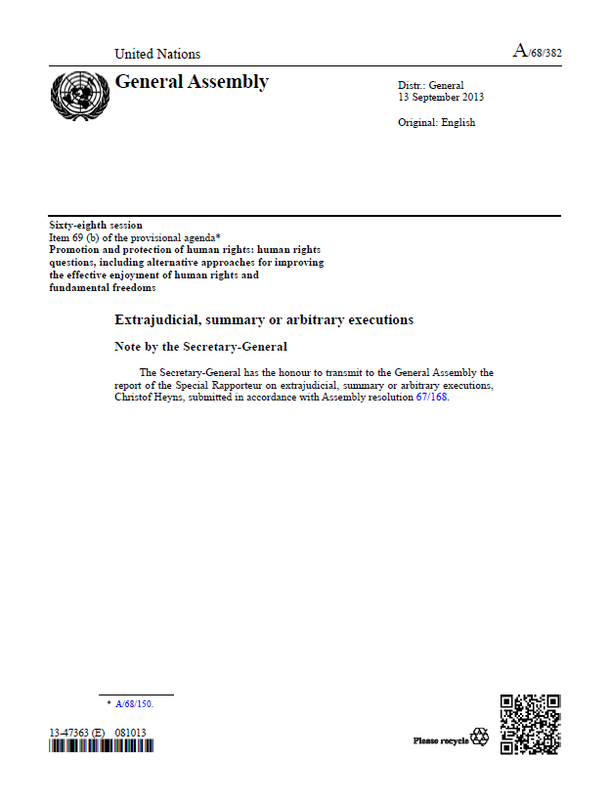 The following is an updated report from the UN Special Rapporteur on Extrajudicial, Summary or Arbitrary Executions. The report was published ahead of an upcoming debate by the UN General Assembly scheduled for later this month. For more information on the document, read Sarah Knuckey’s analysis for Just Security. In the present report, the Special Rapporteur focuses on the use of lethal force through armed drones from the perspective of protection of the right to life. Although drones are not illegal weapons, they can make it easier for States to deploy deadly and targeted force on the territories of other States. As such, they risk undermining the protection of life in the immediate and longer terms. If the right to life is to be secured, it is imperative that the limitations posed by international law on the use of force are not weakened by broad justifications of drone strikes. The Special Rapporteur examines the ways in which the constitutive regimes of international law, including international human rights law, international humanitarian law and the law on the inter-State use of force, regulate the use of armed drones. He reiterates that these legal regimes constitute an interconnected and holistic system and emphasizes the distinctive role of each in protecting the right to life. He cautions against wide and permissive interpretations of their rules and standards and underlines the centrality of transparency and accountability obligations. 12. New methods of employing lethal force are continuously developed. On the horizon, for example, developments in nanotechnology and biotechnology2 and in autonomy and robotic systems (see A/HRC/23/47) present eventualities that the international community must address in coordinated ways. Drones, assumed for the purposes of the present report to be armed drones, have moved from the horizon into the realm of the known. The appeal of drones is clear. Among other things, they provide the strategic advantage of greatly reducing the time between the identification of a potential target that could be a great distance away and the deployment of deadly force against that target. Drones, it can safely be said, are here to stay. 13. There is broad agreement that drones themselves are not illegal weapons. This is not the case, for example, with lethal autonomous robots. There is, however, a notable lack of consensus on how to apply the rules of international law that regulate the use of force to drones, the fact that drones are now an established technology notwithstanding. It is the aim of the Special Rapporteur in the present report to contribute to clarifying the application of those rules and to reiterate their authority, from the perspective of protection of the right to life. 14. Drones can be expected to become more sophisticated and available in more compact form, and also to become less expensive and therefore more accessible. They are likely to form part of the arsenals of an increasing number of States that may be able to deploy such force across international borders in relatively non-intrusive and sometimes non-attributable ways, on the battlefield and to pursue targets far removed from what would traditionally be seen as zones of armed conflict. Some States may also wish to use armed drones in domestic law enforcement contexts, such as for border patrols, operations against organized crime and crowd control in demonstrations. Armed drones may fall into the hands of non-State actors and may also be hacked by enemies or other entities. In sum, the number of States with the capacity to use drones is likely to increase significantly in the near future, underscoring the need for greater consensus on the terms of their use. 15. The ready availability of drones may lead to States, where they perceive their interests to be threatened, increasingly engaging in low-intensity but drawn-out applications of force that know few geographical or temporal boundaries. This would run counter to the notion that war — and the transnational use of force in general — must be of limited duration and scope, and that there should be a time of healing and recovery following conflict. 16. Peace should be the norm, yet such scenarios risk making its derogation the rule by privileging force over long-term peaceful alternatives. The expansive use of armed drones by the first States to acquire them, if not challenged, can do structural damage to the cornerstones of international security and set precedents that undermine the protection of life across the globe in the longer term. There is also uncertainty about the extent to which States are newly acquiring the technology and, because their engagement in the current debates is limited, about what their approach will be in the future. 17. On the one hand, it is often said that drones contribute towards more accurate targeting and can reduce civilian casualties. On the other, drones make it not only physically easier to dispatch long-distance and targeted armed force, but the proliferation of drones may lower social barriers in society against the deployment of lethal force and result in attempts to weaken the relevant legal standards. 18. Given that drones greatly reduce or eliminate the number of casualties on the side using them, the domestic constraints — political and otherwise — may be less restrictive than with the deployment of other types of armed force. This effect is enhanced by the relative ease with which the details about drone targeting can be withheld from the public eye and the potentially restraining influence of public concern. Such dynamics call for a heightened level of vigilance by the international community concerning the use of drones. 19. A decade or so ago, the use of armed drones was relatively novel and untested; their human impact and further technological development were hard to predict, and a full discussion of the proper application of the international legal framework had yet to emerge. A vast body of academic and advocacy literature has now developed, and civil society watchdogs are tracking the issue and pursuing transparency. Armed drones have been debated in various forums of the United Nations, intergovernmental bodies and national Governments and courts. Recent initiatives that help to shape the international response and consensus, for example by the European Parliament and an independent advisory committee of the Government of the Netherlands, deserve attention and support. 20. Looking backwards and forwards, and keeping in mind the advent of new weapons systems waiting in the wings, the current moment provides an opportunity to take stock. It is a chance to reflect on the outlines of the debate as it currently stands, to restate the law in some places, to identify the main disagreements and to address some of the contentious issues. This opportunity may be further facilitated by the fact that available information suggests that the present number of drone strikes may at the moment have declined. 21. The Special Rapporteur emphasizes that the various components of international law developed over the ages create a finely balanced system to address immediate security concerns, in addition to the need to protect the right to life in the short and long terms. International security and the protection of the right to life depend on the principle that the use of force is a matter of last resort. 22. The most immediate protection for the right to life is provided by the international human rights law framework. This is the default legal regime from which deviations are permissible only when, and for as long as, those who justify the more permissive use of force under international humanitarian law can show that the requisite conditions have been fulfilled. 23. An outer layer of protection for the right to life is the prohibition on the resort to force by one State against another, again subject to a narrowly construed set of exceptions. The protection of State sovereignty and of territorial integrity, which on occasion presents a barrier to the protection of human rights, here can constitute an important component of the protection of people against deadly force, especially with the advent of armed drones. 24. A central point made by the Special Rapporteur is that a holistic approach is needed in order to protect the right to life. For a particular drone strike to be lawful under international law it must satisfy the legal requirements under all applicable international legal regimes. Although a particular drone strike may satisfy the requirements for the use of inter-State force, it may nevertheless be inconsistent with applicable rules of international humanitarian law and international human rights law, or vice versa, and thus unlawful under international law. The right to life can be adequately secured only if all the distinct requirements posed by the various constitutive parts of international law are met. 25. The present report is in parallel to that submitted to the General Assembly by the Special Rapporteur on the promotion and protection of human rights and fundamental freedoms while countering terrorism, which pertains to the topic of drones from the perspective of his mandate (A/68/389). While the two reports are separate and independent, they cover, to some extent, the same ground. 42. The use of drones by one State in another State’s territory raises the question whether States can be held accountable for their actions outside their own territories. 43. Reference was made earlier to the status of the right to life as a general principle of international law and a customary norm. This means that, irrespective of the applicability of treaty provisions recognizing the right to life, States are bound to ensure the realization of the right to life when they use force, whether inside or outside their borders. 44. In addition, States are bound by those treaties to which they are a party and are subject to monitoring by their respective supervisory mechanisms. The applicability of such treaties is normally limited to individuals under the jurisdiction of a State party. Jurisdiction has a territorial and a personal dimension. All persons finding themselves within the territory of a State are presumed to be within its territorial jurisdiction. 45. That human rights treaty obligations can apply in principle to the conduct of a State outside its territory has been confirmed by, among others, the International Court of Justice, the Human Rights Committee, the Inter-American Commission on Human Rights and the European Court of Human Rights. 46. States exercise territorial jurisdiction beyond their own borders where they exercise effective control over other territory, while personal jurisdiction is established where the State has physical power, authority or control over individuals. 47. Drones enable a State to perform targeted killing without exercising effective control over territory and without having the individual in custody, however. Accordingly, it must be asked whether such targeting can result in violations of the right to life under the applicable treaties. 48. There is limited case law on this matter. In Alejandre, the Inter-American Commission on Human Rights concluded that the shooting down of two private aeroplanes registered in the United States of America by Cuban military aircraft in international airspace violated the right to life of the passengers. At the same time, in Banković, the European Court of Human Rights held that persons killed during aerial bombings by the North Atlantic Treaty Organization of a radio station in Serbia did not fall within the jurisdiction of the participating States for the purposes of establishing whether they had violated the right to life. The broad sweep of this decision has, however, increasingly been narrowed in subsequent cases in the same system, and it is not clear that the position can be sustained. 49. It has been argued that the deliberate killing of selected individuals through extraterritorial drone strikes is likely to bring the affected persons within the jurisdiction of the operating State. Pursuing this line of reasoning, where a State targets individuals abroad with lethal force, it can be argued that it intends to exercise ultimate control over the individuals concerned, resulting in those actions being governed by the State’s human rights treaty law obligations. 50. That a State has human rights obligations with regard to conduct outside its territory does not automatically mean that those obligations are the same as those that arise within its territory. In principle, while control of territory means that a State has obligations, guaranteed by international law, not only to respect but also to ensure and to fulfil the human rights of those on the territory, the exercise of authority with regard to an individual by State agents in the absence of territorial control at a minimum triggers the State’s obligation to respect the rights of those individuals. 51. It has been held that human rights treaties cannot be interpreted so as to allow a State party to perpetrate violations of the treaty on the territory of another State, which it could not perpetrate on its own territory. The same must apply to the right to life as a part of general international law and custom. The conclusion appears to be that any positive action by a State, on its own territory or that of another State, must be carried out in compliance with its human rights obligations under all applicable rules of international law.